Synergy® 2.0 accessories and replacement parts. Easy to adjust large knobs with gloves on. five adjustable heat settings per knob. Black connector plugs into heated garment while red connector goes to power lead. Extra black connector allows for additional Synergy heated apparel connections, and independent control of a Synergy heated garment. 19” in length. Easy to adjust large knobs with gloves on. five adjustable heat settings. Black connector plugs into heated garment while red connector goes to power lead. 19” in length. Provides a direct connection from your heated Synergy garments to an accessory port. 18” relaxed – 38” extended. Creates two extensions coming off Power Lead Harness. Use with SAE Coaxial Adapter to create connection for battery tender and heated garment. 10” in length. Allows first generation Synergy heated apparel to connect to rheostat controller. 10” in length. Creates two powered extensions coming off Power Lead Harness. Use with SAE Coaxial Adapter to create connection for battery tender and heated garment. 57” in length. Allows rider additional room to maneuver when connected to bike, UTV, Snowmobile, ATV, or other Powersports vehicles. 15” relaxed – 38” extended. Allows rider to secure their Tour Master Synergy rheostat controller to their thigh for convenient access. 25" Relaxed - 32" Extended w/ 4 3/4" Hook & Loop Adjustment. The Coax Extension Cable is a heavy-duty cable that allows 7” of extension to a connector cable with male connector at each end. The Coax Extension is a heavy-duty cable that allows 7” of extension to a connector cable. Connects to the red positive (+) and black negative (-) battery terminals while the opposite end connects to the heated garment. 15-Amp fuse maximum. Available in both 38 and 70 inch. Convert a SAE battery tender lead to a coax connector for Synergy heated gear. Use with optional v-split connector. Approximately length 10”. 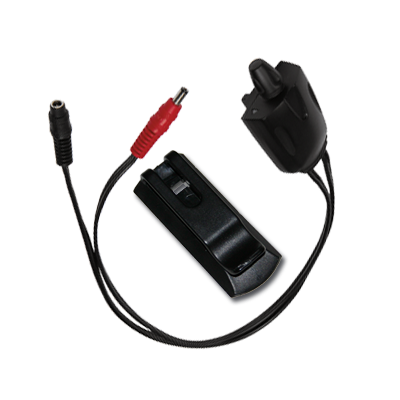 For used with BMW accessory port to power Synergy heated apparel up to 5 amps (over 5 amps must use battery wiring harness connection). 10” in length.